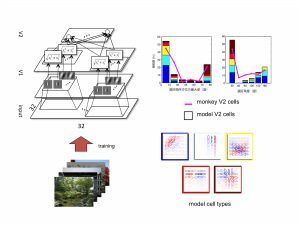 What are the computational principles underlying the remarkable capability of the primate visual system? Our goal is to answer this question from theoretical point of view. Our specialty is the approach using machine learning techniques for constructing computational models that account for properties of neural visual processing. We particularly focus on higher visual processing close to cognition such as representations of objects and faces in higher visual cortex and context-dependent visual recognition via feedback processing. We use the constructed models to explain experimental facts that have been revealed in neurophysiological studies and thereby gain insight into visual computation in the brain. We also aim at transferring the results obtained from our studies to novel artificial intelligence technology. Understanding of V2, the second stage in the visual cortex, is far behind the primary visual area (V1). To shed light into computation in V2, we hypothesized that the sparse coding principle, which previously explained well receptive field properties of V1, may continue in V2. Thus, we constructed a “hierarchical sparse coding model,” built on top of a standard V1 model and trained with natural image patches. As a result, our model explained, qualitatively and quantitatively, three tuning properties known for V2. The result also suggests the importance of model cells representing corner-like features. Hosoya H, Hyvarinen A. A Hierarchical Statistical Model of Natural Images Explains Tuning Properties in V2. Journal of Neuroscience. 2015;35:10412?28. The higher visual cortex in primate brain has neurons that are specialized to visual face representation in restricted cortical regions. To investigate the possible coding principles of those neurons, we propose a “mixture of sparse coding models,” which assumes two separate modules of feature representations for natural objects and faces and competitive computation between these two. 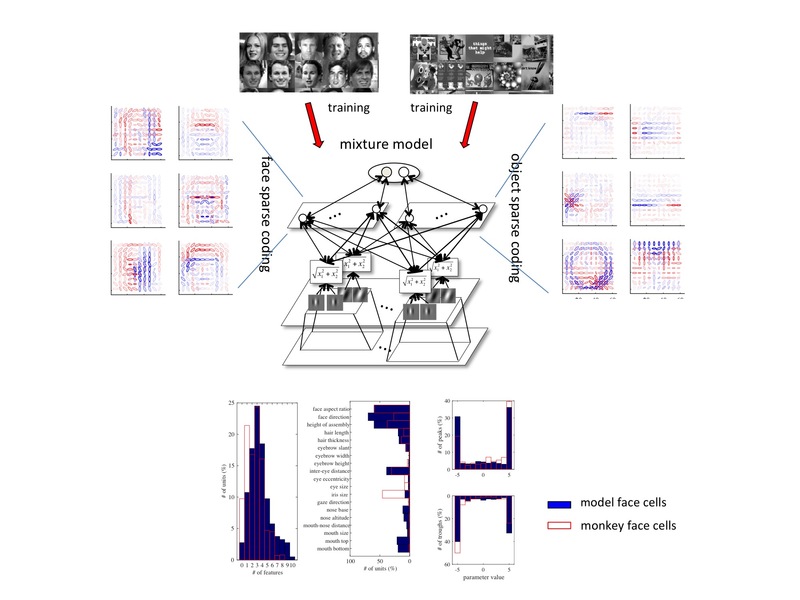 Our model explained, qualitatively and quantitatively, the prominent face selectivity as well as a number of tuning properties to facial features that have been discovered in a region called middle patch in the monkey inferotemporal cortex. Our model also suggests a possible mechanism that allows parts-based and holistic processing to coexist in a single system. Hosoya H, Hyvarinen A. 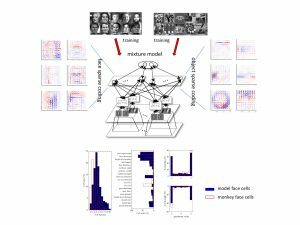 A mixture of sparse coding models explaining properties of face neurons related to holistic and parts-based processing. bioRxiv, 2016. doi: http://dx.doi.org/10.1101/086637.